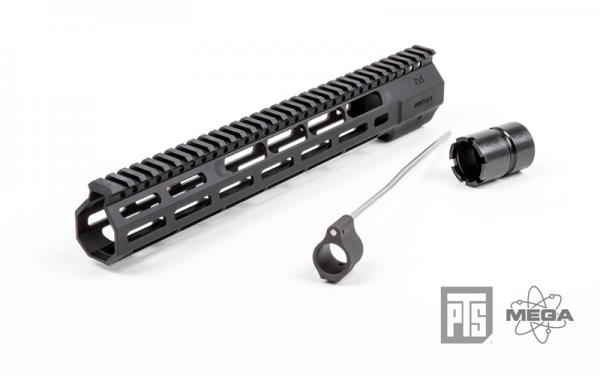 The PTS® Mega Arms "Wedge Lock" Handguard is a very sleek, modern looking M-LOK compatible handguard that is skeletonized for lightweight without compromising strength. 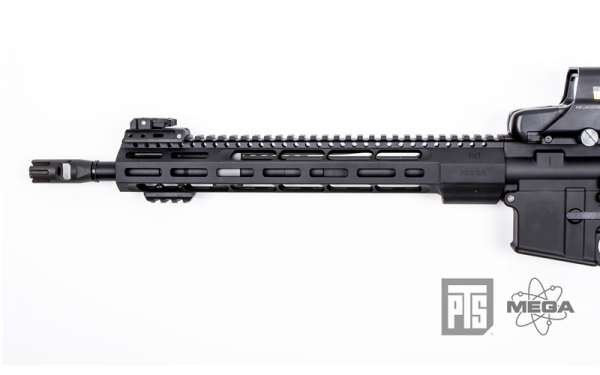 The handguard's narrow cross-section provides for an excellent ergonomic grip and has slab sided surfaces for improved shooting stability off supported positions. It is given its name due to its extremely tight but very simple rifle mounting system design. The "Wedge Lock" system consists of two wedge-shaped planes, both at complementary angles that push against each other by simply tightening a screw, thus creating tension between the handguard and the barrel nut. The Wedge Lock provides for a very rigid mount between the rail and the receiver which also ensures superior accuracy of aiming accessories such as lasers even from supported positions. - M-LOK (Modular Lock) Mounting System for Accessories to Rail.